ChasingTreasure.com Jewelry Boxes Blog: What is Bubinga Wood, and Why is it Such a Popular Material for Jewelry Cases? What is Bubinga Wood, and Why is it Such a Popular Material for Jewelry Cases? Bubinga wood is a popular material for luxury jewelry boxes due to its durability, immunity to the elements (especially moisture), and overall exotic look. While it is found worldwide, the main Bubinga species are found in the equatorial region of Africa and South America, and is commercially known as African Rosewood. It is in these swampy, tropical regions that this wood has adapted its desired traits: high oil content, hardness & density, excellent strength-to-weight ratio, and high shock resistance. Because of these properties, it can be difficult to use in construction. Its hardness easily wears down cutting blades, requiring specialized edges, and the oil content that makes it resistant to moisture (and therefore rotting) poses challenges for gluing and staining. These Bubinga characteristics make it an excellent material for furniture, and the effort needed to turn this durable wood into an heirloom that can last for a century is what makes it a luxury. The beauty of this wood is apparent: its colors range from pink to deep red, with violet and brown streaks throughout. Its grain pattern is also unique among hardwoods in that it fluctuates from straight to interlocking, and can also contain other grain patterns like quilted, pommel, and waterfall. Certain cutting techniques can bring out the grain's swirling and veining to enhance the natural appearance. Bubinga wood has many other uses such as flooring, tool handles, and decorative veneers. But most notably, it is used in guitars and drums because of its superb musical qualities. 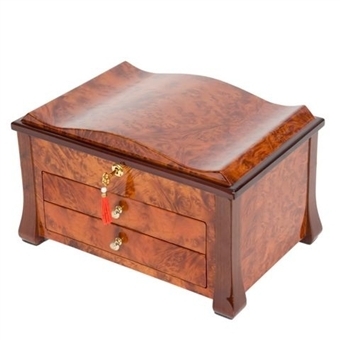 So as you think about purchasing a new jewelry box, you should seriously consider a Bubinga wood design. Its ruggedness and unique ring patterns provide a beautiful and functional piece that can last a lifetime.